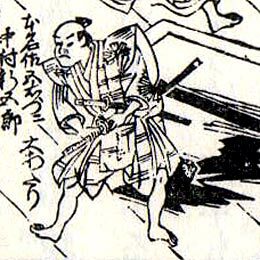 1702: first stage appearance in Ôsaka; he performs as a wakaonnagata under the name of Iwai Genjirô. Later on, he becomes disciple of Nakamura Shirogorô I and receives the name of Nakamura Shingorô I. 11th lunar month of 1710: Shingorô becomes tachiyaku and plays in Ôsaka in the kaomise drama "Shinzome Hinagata Chôja". He also achieves a great success by performing in a sanbasô dance. 5th day of the 1st lunar month of 1712: his master Nakamura Shirogorô I dies. 1st lunar month of 1713: Shingorô goes to Kyôto. 11th lunar month of 1713: Shingorô becomes zamoto. 2nd lunar month of 1714: Shingorô produces in Kyôto the kaomise drama "Tarôzuki Wakô no Ônuki". Fall 1715: Shingorô goes back to Ôsaka. 11th lunar month of 1715: Shingorô plays in the kaomise drama "Saiwai Mochimaru Chôja", which celebrates the shûmei of Iwai Hanshirô III. 11th lunar month of 1717: Shingorô plays in Ôsaka at the Kado no Shibai the role of Amakawa Kinzô in the kaomise drama "Benten Chôja Uga no Tama", which was produced by Ogino Kinnojô. 11th lunar month of 1723: Shingorô performs at the Kado no Shibai in the kaomise "Kogane no Hanagata", which is produced by the zamoto Arashi San'emon III and celebrates the arrival in Ôsaka of the Edo star Ôtani Hiroji I. 1st lunar month of 1724: premiere at the Kado no Shibai of "Edoe Ukiyo Soga", an Edo-flavored new year drama welcoming in Ôsaka the Edo actor Ôtani Hiroji I; Shingorô plays the roles of Ninomiya Tarô, Kanki and Tachibotoke Tahei (Gokumon Shôbei) [more details]. Fall 1724: Shingorô goes to Kyôto. 11th lunar month of 1724: Shingorô plays in the kaomise drama "Yomeiri Miyako no Shimadai", which is produced by the zamoto Ogino Umenosuke at Ebisuya Kichirôbê's theater. 1st lunar month of 1726: Shingorô's rank in the Kyôto hyôbanki, tachiyaku section, is jô-jô-kichi (superior - superior - excellent). 11th lunar month of 1728: Shingorô plays the role of Kanemori Sôjûrô in the kaomise drama "Daimyô Kogane no Uroko", which is produced by Sanogawa Mangiku at Hayagumo Chôdayû's theater. Fall 1729: Shingorô and Arashi Koizô I go together to Edo. 11th lunar month of 1729: Shingorô achieves a great success at the Moritaza, playing in the kaomise drama "Yahagi no Chôja Kogane no Ishizue". 11th lunar month of 1730: Shingorô moves to the Ichimuraza and plays the role of Sano Genzaemon Tsuneyo in the kaomise drama "Hiragana Tokiwa Hachinoki". 1st lunar month of 1731: Shingorô's rank in the Edo hyôbanki, tachiyaku section, is jô-jô-kichi (superior - superior - excellent). Fall 1731: Shingorô goes to Kyôto. 11th lunar month of 1731: Shingorô plays the role of Hirado Gengobê in the kaomise drama "Hiragana Imagawajô", which is staged in Miyako Mandayû's theater. 9th lunar month of 1732: first Kabuki adaptation of Matsuda Bunkôdô and Hasegawa Senshi puppet theater drama "Dan no Ura Kabuto Gunki", which is produced in Kyôto by Sakakiyama Shirotarô I at Miyako Mandayû's theater; Shingorô plays the roles of Iba Jûzaemon and Kagekiyo [casting]. Fall 1734: Shingorô and Anegawa Chiyosaburô I go together to Edo. 11th lunar month of 1734: Shingorô plays at the Nakamuraza the role of the boatman Konpira Sugiemon, in reality Mando, in the kaomise drama "Kyôganoko Secchû no Tamatori". Fall 1735: Shingorô goes to Kyôto. 11th lunar month of 1735: Shingorô plays the role of Ôdaka Kôsuke in the kaomise drama "Bankoku Ôshimadai", which is produced by Nakamura Tomijûrô I. Fall 1737: Shingorô goes back to Ôsaka after 13 seasons spent in either Kyôto or Edo. 11th lunar month of 1737: Shingorô plays at the Kado no Shibai in the kaomise drama "Iwatogura Kogane Masugata", which is produced by Iwai Hanshirô III. 1st lunar month of 1738: Shingorô's rank in the Ôsaka hyôbanki, tachiyaku section, is jô-jô-kichi (superior - superior - excellent). Fall 1738: Shingorô goes to Kyôto. 11th lunar month of 1738: Shingorô plays in Tomimura Takichi's kaomise drama "Ichi no Tomi Hôrai Yakata", which is produced by Nakamura Tomijûrô I at Kameya Kumenojô's theater. 1st lunar month of 1739: Shingorô plays in the same theater the roles of Chûgen Gisuke, Iyo Daijin and Hiyô Kuroemon in the drama "Keisei Arashiyama". Fall 1739: Shingorô and his adopted son Nakamura Tomijûrô I go back to Ôsaka. They most likely perform at the Kado no Shibai. 11th lunar month of 1740: Shingorô plays at the Ônishi no Shibai in the kaomise drama "Yaguruma Yakata no Fuji", which is produced by Nakamura Tomijûrô I. Fall 1741: Shingorô, his adopted son Nakamura Tomijûrô I, Nakayama Shinkurô I and Ôtani Hiroji I go together to Edo. 11th lunar month of 1741: Shingorô plays at the Nakamuraza a minor role in Hayakawa Denshirô's kaomise drama "En'ya Hangan Kokyô no Nishiki". 1st lunar month of 1742: Shingorô plays in the same theater the roles of Hitachinosuke Yorikuni and Yaoya Kyûbê in the drama "Musume Soga Gaijin Yashima". Fall 1743: Shingorô goes back to Ôsaka. 11th lunar month of 1743: Shingorô plays at the Ônishi no Shibai the role of Akamatsu Danjô in Namiki Sôsuke's kaomise drama "Futatsu Biki Nishiki no Manmaku", which is produced at the Ônishi no Shibai by the zamoto Nakamura Jûzô I and celebrates the arrival in Ôsaka of the star Sawamura Sôjûrô I. 12th lunar month of 1745: the drama "Natsu Matsuri Naniwa Kagami" is performed for the first time in Ôsaka, simultaneously in the three major theaters of the city, which starts a competition for the best performance; Shingorô plays the role of Tsuribune Sabu at the Kado no Shibai [casting]. Fall 1746: Shingorô goes to Kyôto. 11th lunar month of 1746: Shingorô plays in the kaomise drama "Tomi Yakata Ômu Kotoba", which is produced at Hoteiya Umenojô's theater by Nakamura Kumetarô I; his stage partners are Sawamura Sôjûrô I, Anegawa Shinshirô I, Sanogawa Jûkichi (final performance before his death), Nakamura Utaemon I, Nakamura Tomijûrô I, Tamiya Jûzaburô I (final performance before his death), Yamatoyama Rinzaemon I (who celebrates his shûmei) and Nakamura Kiyosaburô I. 1st lunar month of 1749: Shingorô falls ill and has to definitively retire. Nakamura Shingorô I was a popular actor, who achieved fame for himself in the Three Cities (Ôsaka, Kyôto, Edo) from the end of the Genroku era to the beginning of the Enkyô era. He was able to perform a wide range of roles as tachiyaku, katakiyaku or jitsuaku.